The Fat Friar was a wizard, who attended Hogwarts School of Witchcraft and Wizardry in his youth, and was Sorted into Hufflepuff. He was a jolly man and very forgiving. He devoted his life to religion and, after his death, returned to the school as the resident ghost of Hufflepuff House. The Friar was born no earlier than 982, somewhere in the British Isles. At the age of eleven, the Friar became a student at Hogwarts School of Witchcraft and Wizardry in Scotland. He was Sorted into Hufflepuff House and was taught in the magical arts the seven years that followed. At some point in his life, he joined the clergy as part of a mendicant religious order. Apparently, given his physically large appearance, he indulged in the pleasures of food and drink. The Friar was executed because senior churchmen grew suspicious of his ability to cure the pox merely by poking peasants with a stick, and his ill-advised habit of pulling rabbits out of the communion cup. The Friar returned from the dead as a ghost, and returned to Hogwarts Castle, where he became the house ghost of his former House, Hufflepuff. Nicholas de Mimsy-Porpington: "My dear Friar, haven't we given Peeves all the chances he deserves? He gives us all a bad name and you know, he’s not really even a ghost — I say, what are you all doing here?" Fat Friar: "New students! About to be Sorted, I suppose?" Shortly before the Start-of-Term Feast on 1 September, 1991, the ghosts came across the first years waiting for Professor McGonagall, while discussing whether Peeves should be allowed to attend the Feast (for he had given the house elves quite a bit of trouble, throwing food and breaking dishes). The Friar was excited to see the new students, and smiled around at them. He later attended the Feast, and waved merrily at students being Sorted into Hufflepuff, notably Hannah Abbott. On 2 September, the Friar haunted the Charms Corridor, chanting aloud as he hovered around. In the evening of 31 October, 1992, the Friar attended Nicholas de Mimsy-Porpington's five-hundredth Deathday Party, where he engaged in conversation with a knight with an arrow sticking out of his forehead. This year, the Friar could be usually seen strolling around the Grand Staircase. Nicholas de Mimsy-Porpington: "You're lucky there's a feast at all tonight, you know. There was trouble in the kitchens earlier." Harry Potter: "Why? Wha' 'appened?" Nicholas de Mimsy-Porpington: "Peeves, of course. The usual argument, you know. He wanted to attend the feast — well, it's quite out of the question, you know what he's like, utterly uncivilized, can't see a plate of food without throwing it. We held a ghost's council — the Fat Friar was all for giving him the chance — but most wisely, in my opinion, the Bloody Baron put his foot down." In the afternoon of 1 September, 1994, the Hogwarts ghosts gathered to decide whether Peeves should be allowed to attend the Start-of-Term Feast. The Fat Friar wanted to give him another chance, but both Nicholas de Mimsy-Porpington and the Bloody Baron decided against it. As a result, Peeves wreaked havoc in the kitchens, spilling soup all over the place and scattering pots and pans everywhere. Ernie Macmillan: "Dumbledore will be back before long. They couldn't keep him away in our second year and they won't be able to this time. The Fat Friar told me — that Umbridge tried to get back into his office last night after they'd searched the castle and grounds for him. Couldn't get past the gargoyle. The Head's office has sealed itself against her. Apparently, she had a right little tantrum." Hermione Granger: "Oh, I expect she really fancied herself sitting up there in the Head's office. Lording it over all the other teachers, the stupid puffed-up, power-crazy old —"
By 1995, there was a tetraptych of the Friar hung in the first-floor corridor. He would frequently haunt this area during this school year. After the Educational Decree Number Twenty-Eight was passed on 21 April, 1996, the Fat Friar saw Dolores Umbridge fruitlessly trying to get access to the Headmaster's Tower, as the Tower had sealed itself against her and later told Ernie Macmillan about it. Albus Dumbledore, Headmaster of Hogwarts, was killed at the hands of Severus Snape in the former's plan on 30 June, 1997. The Hogwarts ghosts were known attendees of his funeral in early July; this likely included the Friar. On 1 August, 1997 the Ministry of Magic was taken over by Lord Voldemort's Death Eaters. By 1 September, 1997, Severus Snape was made Headmaster of Hogwarts while his fellow Death Eaters, Alecto Carrow and Amycus Carrow became the Muggle Studies and Defence Against the Dark Arts teachers respectively. The Carrows were put in charge of all discipline and punishments, which were violent. Many people had bruises, cuts, or scars from the evil siblings. It is likely the Friar, as did the Heads of House, tried to protect the pupils from Alecto and Amycus. On 2 May, 1998, the Battle of Hogwarts ensued after Lord Voldemort learned Harry Potter was in the premises. The ghosts, likely including the Friar, attended a gathering in the Great Hall, in which Professor McGonagall gave instructions on evacuation of underage students and Kingsley Shacklebolt organised the participants for battle. Later on, the ghosts gathered at the Great Hall, joining the mass mourning over the dead. When the Second Wizarding War comes to an end, it is possible that the ghosts (including the Friar) celebrated Harry's victory and Voldemort's demise. 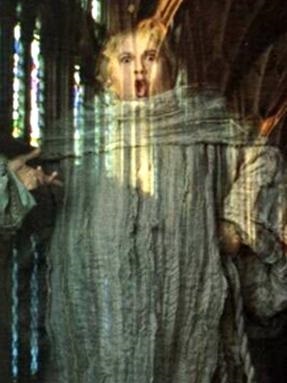 As a ghost, the Friar was pearly-white and slightly transparent, like all other ghosts. He had short brown hair, which he wore with a small tonsure. At first sight a monk, he was dressed in a habit held by a rope belt. He was fat and short, and usually carried a mug with him. The Friar was very cheerful and welcoming, and happily greeted new students at Hogwarts. He also tended to find something to value in anyone and look past their faults, as he always insisted with the other ghosts to let Peeves attend the Start-of-Term Feasts despite his many wrongdoings. He also appeared to be quite sociable, meeting and engaging in conversation with fellow ghosts during Nicholas de Mimsy-Porpington's five-hundredth Deathday Party. He also seems to have some House pride, as he happily reminisced about his "old House" when welcoming first-years. Despite this, he was always resentful of the fact that he was never made a cardinal. Healing magic: He could cure people with the touch of his wand. The Friar was portrayed by Simon Fisher-Becker in the film adaptation of Harry Potter and the Philosopher's Stone, the only film he has appeared in. The Friar is the only House ghost whose death was not discussed in the books. The circumstances of his death were finally revealed via Pottermore. The Fat Friar's name is probably a pun on the term "Fat Fryer"; equipment used to deep fry food, such as chips. It is associated with food, as is the Fat Friar and Hufflepuff in general. Alternatively, the Fat Friar's name could be alliterative and a nod to the character Friar Tuck, as well as the historical Robert Stafford, a real-life chaplain linked to the name Friar Tuck in 1429. The term "Friar" refers to a man who is a member of a religious order which relies on charity, such as in Catholic Christianity. This ties in with the Friar's religious affiliation during his life. ↑ 1.0 1.1 Given Hogwarts was founded in around 993 A.D. and that the Friar attended it, he must have been eleven by or after the school's founding. So, the earliest date he could have possibly been born is 982. ↑ 4.0 4.1 Questions and More Questions on the Harry Potter Lexicon. "If a teacher is head of a house, can we assume that they were sorted into those houses when they were students at Hogwarts? Is that also true for the house ghosts?" "Jo's response: (yes)"
This page was last edited on 9 July 2015, at 18:04. This text is available under the GNU FDL and may have been adapted from the Wikipedia article about Fat Friar (history).